Cats have surely gained popularity in recent times. Especially on the Internet scene, a variety of cats have made themselves quite the stars. Cats have been my favorite animals for most of my life. I've been fond of cats since childhood. There's just something about them that just really makes me like them. Maybe I liken cats as being intelligent creatures, always curious and ambitious, able to stand their own ground, are very agile and adaptive... there is just something to love about cats. Much as I've done with rabbits and horses previously... it is time I blog about cats. 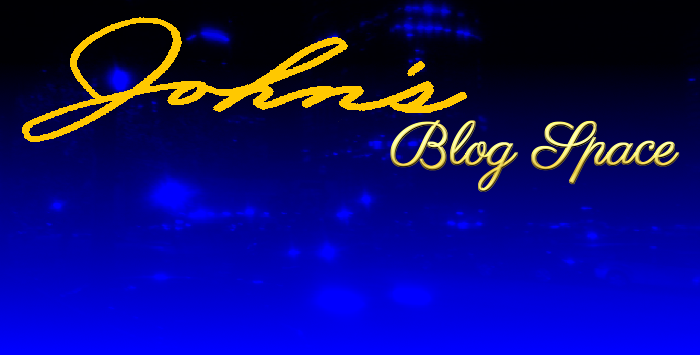 Hello to all the cat lovers out there reading John's Blog Space! This blog post is a reborn version of a past blog post. It was first released on October 10, 2011; and the last update to it was in January 25, 2012. It has been very poor in getting views- some 36 views were accumulated in its time since. Being disappointed with its performance, I deleted the old post and brought it back with a new makeover. So this blog post has been made over and reborn. I understand the importance of establishing a positive atmosphere, so I want to do nothing more than offer a positive and fun place for which to discuss a topic like this. Do you love cats? I hope this blog post will warm your heart. This is dedicated to all of you who love cats. I hope you will be able to enjoy all that I have to provide for all of you. I know there are people who would rather prefer dogs over cats. Often times, I get jaded about always hearing about vicious dogs being involved attacking people as well as other dogs. How often do you hear of violent cats (except for the ferocious cats, like panthers, tigers, lions, etc.)? It's almost as if people tend to dislike cats so much that they usually have them neglected. Again- there are lots more people who'd rather have dogs than cats, but as a cat lover, cats need the own time in the spotlight. What Do Cats Signify to/for People? I don't know my cat breeds too well and what makes them different. You have cat types like Scottish Folds, tabbies, and cats like that. Many nations have such felines in their coat of arms, on their flag, or even as icons of a city or nation. Having such fierce felines (especially lions) usually signify power and wisdom. For example, Singapore's mascot is the Merlion- a mermaid lion. The use of such felines mean many things to many people in many applications. If you're a sports fan, you've heard of lots of feline-nicknamed teams. For example... here are some pro examples of feline mascots: the Cincinnati Bengals, Jacksonville Jaguars, Detroit Lions, Carolina Panthers, Detroit Tigers, Florida Panthers, and the Arizona Sabrecats. Now for MANY college examples about feline mascots: University of Houston Cougars, Louisiana State University Tigers, Auburn University Tigers, University of Kentucky Wildcats, University of Pittsburgh Panthers, Pennsylvania State University Nittany Lions, Brigham Young University Cougars, Arizona Wildcats, Western Carolina Catamounts, Lafayette Leopards, Northern Iowa Panthers, College of Charleston Cougars, Chicago State Cougars, IUPUI Jaguars, Tuskegee University Golden Tigers, and teams like that. Even sports teams can appreciate the ferocity and character felines have. Even here in Houston, we are sometimes called the Wildcat City, and us Houstonians are sometimes called Wildcatters. Wildcatters was one of the nicknames that was considered to name the team eventually called... the Houston Texans of the NFL. So even sports teams can appreciate feline mascots and nicknames and what each represents. ^ from: scisoc.org.au - Here's a cute cat to start things off. Isn't this kitty cute? ^ from: www.buzzfeed.com - Cats can be quite fascinated with yarn. This kitty is having fun with this ball of yarn. ^ from: www.ebog.net - This is the ever-famous Nyan Cat. For more information on it, learn more about this Internet meme at this knowyourmeme.com entry on Nyan Cat. I hope you enjoyed these pictures! I may add more in future edits. I usually show videos and pictures whenever I do posts like this. However, I will only feature videos to set the tone for this blog post. Thanks to all the YouTube channels that allowed for embedding. If there are must-see videos that are not embedded, I will add links to the videos so you can view them privately. I am careful not to feature videos of cats in potentially dangerous situations. The point of these videos is to showcase them in an entertaining and fun manner. This is all supposed to be lighthearted and fun. ^ "Kittens And Cats Meowing"
^ "Cat playing ping pong"
^ "Cute Kitten Playing With Fake Cat | Porcelain Fight"
^ "Tiger Cat Mom Talking to Her Kittens"
^ "Underground Kitty & Watch the Birdie Hello Kitty's Paradise"
Nyan Cat (or Pop Tart Cat). Earlier in 2014, there was a cat who famously fended off a dog who attacked a little boy while on his bicycle. This cat- named "Tara" was a heroine who prevented the boy from being further hurt. The video on YouTube has garnered over 23M views as of this post. The cat herself is affectionately known as "Tara the Hero Cat." Even though embedding of this video is allowed, I am only providing the link to this video because it has some graphic elements to it, namely pictures of the blood the boy shed from the dog attack. So if you want to see the video, follow this link: My Cat Saved My Son (YouTube). ^ from: www.people.com (best I could find) - There she is- Grumpy Cat! Forgive me if I'm not at as educated as I should be on any sort of trends in entertainment. However, the ever-popular Grumpy Cat is a very popular cat. 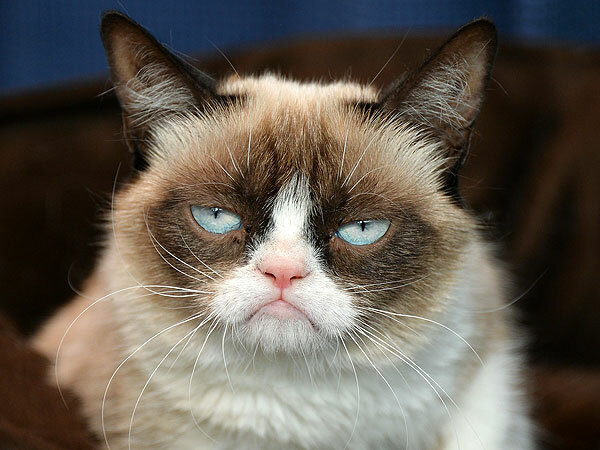 The cat is named "Tardar Sauce" but is also known as Tard and of course... Grumpy Cat. She is known as "Grumpy Cat" among the online realm because of her grumpy facial appearance, which is told to be a result of her feline dwarfism. I can make mention to many more, but I'll stop here for now. I may provide more links in edits. Let me know if there are any I should feature. Remember- help me help my readers/visitors. I don't blog for myself; I do this for everybody. So PLEASE help if you can and if you'd like to.